MARINERS - THE PERFECT BEACH SIDE BED & BREAKFAST. A superb base to explore from and a beautiful place in which to relax. If like us you have a love of the sea, then you need to look no further. We are situated on the Esplanade in Seaton, East Devon. Our unparalleled sea front position offers guests panoramic views over Lyme Bay, towards the chalk cliffs of Beer Head. Mariners is on Devon's Jurassic Coastline, we are 7 miles to the west of Lyme Regis and 10 miles to the east of Sidmouth, Exeter is 26 miles away. Over the past ten years we have developed Mariners to take full advantage of it's commanding location. Most of our contemporary and individually styled bedrooms have uninterrupted full sea views. Both of our self catering apartments have south facing balconies overlooking Lyme Bay. We are proud of the Mariners renowned breakfast experience. We offer a wide selection of individually cooked to order dishes prepared by the proprietor and former chef lecturer. Spacious room with king size bed and panoramic full sea and headland views from a large picture window. 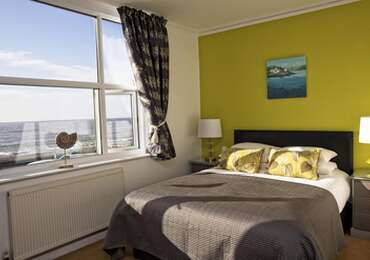 Large spacious room with seating area.The room has a king size bed and single bed.The room has a very large picture window offering spectacular full sea and headland views.The room has a good sized en-suite bathroom with a walk-in shower. A spacious sea view room with a kingsize bed, a full size single bed and seating area.Suitable for three people or a family with one child.Large enough to accommodate a travel cot as well.